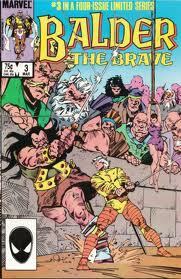 We are back and Balder the Brave just gets better and better as it goes on. I'm really kicking myself for not taking the time to sit down and read this book. So our setting is in Jotunheim and Agnar has found the dead body of our hero Balder. But wait, it's not really him. In a flashback scene Balder gets a gut feeling that he is being lured into a trap. Oh that Balder, not only is he the only man who can rock a totally white hair-do but he's pretty dang smart too. He should have been a cop. Balder sends the slave of Karnilla ahead of him with Balder's own armor on and the Frost Giants waste the norn slave. Why is it that nobody mourns for the norn slave? Oh well. As the Frost Giants return to their castle Balder follows undetected behind them. Balder strolls around the castle until he finds a white sparrow( it's really Karnilla) and decides to save it from the Frost Giants. After sitting for awhile he tells the sparrow that he is not leaving the castle without his dear Karnilla. Karnilla as a sparrow imbued Balder with a white hot bolt of strength. The king of the Frost Giants notices the warm in his ever cold castle and they are lead back to Balder. Using Karnilla as bait the Frost Giants force Balder into a fight to the death. (Oh No). The Frost Giants aren't without mercy and a sick sense of humor so Balder battles a Frost Giant that is his own size. The small Frost Giant is named Hagen and his is the smallest of the Frost Giants. He also has the Sword of Frey. It was mentioned in the first issue and is one the most powerful weapons in the nine realms. During the fight Balder is able to stay one step ahead of Hagen but is starting to falter. Thanks to some quick thinking on the part of Balder he is able to knock out Hagen and take the all powerful sword into possession. (who does Balder think he is? He-Man?) Agnar shows up to lend a hand but the Frost Giant king tells Balder and Agnar to throw down their weapons or he will kill Karnilla! Well to some it up this was a thrill ride story with lots of cool twists and turns. It's a shame that most comics don't read like this anymore. Great pace and Sal Buccema is a master draftsmen. To be honest he's a better artist than Simonson. Real Talk.